With the developing technology and businesses moving towards project management, it is the right time to get certified to make you a worthy employee for any company. By adding one of the best Project management certifications to resume, any IT professional can get better chances to become successful in the future. Every IT pro can get benefits of adding a project management certification to his existing credentials. In this blog, you will know about all the main project management certifications which would add value and also help you to improve your skills. Do you want to become a project manager? Are you looking for ways to enhance your prospects in project management? As there are a number of project management certification courses, it becomes difficult for you to select the one for yourself. If you want to add value to your career, then it is very necessary that you get training for it. If you want to get an edge over other competitors for the same job, then you definitely need a certification. Don’t want to lag behind in this competitive world? 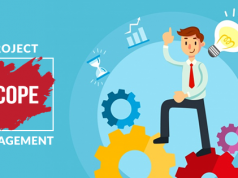 If you want to stay ahead from other project management employees, then it is very necessary that you choose the best project management course for yourself. Although, there is a number of courses available in the market you need to ensure that you select the most appropriate course which can help in improving your career and getting more job opportunities. Do you want to get your salary increased as a project management professional? If yes, then you should get the PMP certification that will help you to get your salary increased in no time. Are you interested in knowing about the best practices which can be used in project management? If your answer is yes, then you should definitely go for the best project manager certification. Now, another question must be coming in your mind and that’s the selection of a particular course. Which project management certification is best for you? 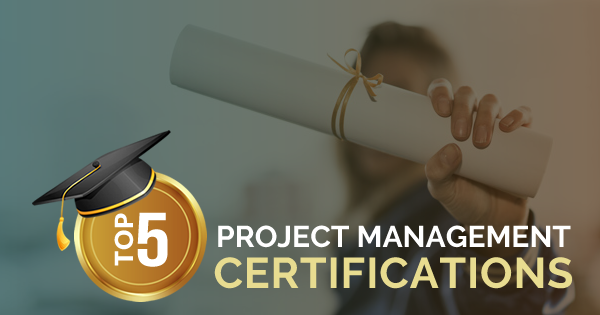 Here, you can know about the top five project management certifications among which you can select the one which is the most suitable for your career. Every year new trends are coming in the project management. Let’s have an insight into the upcoming project management trends in 2019.
Who doesn’t want to get promoted? Don’t you want a better position in the IT sector? Are you looking for a perfect job for yourself? If yes, then you need to have something different as compared to other candidates who are applying for any job in the project management field. You can opt for one of the highest paying project management certifications with which you can be able to get an increased salary package or you might get promoted any time. Among the top project management certifications, Project Management Professional (PMP) certification is a kind of difficult test in which almost everything is covered. 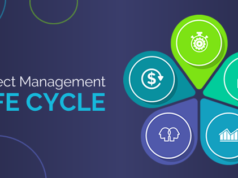 You can validate your skills and knowledge in the management of costs, time and scope with this most demanded project management certification. This certification is offered by the Project Management Institute and basically works with businesses and academia to ensure the significance of the certification. The PMP certification is offered by the Project Management Institute (PMI). Interested candidates should have a four-year degree and the experience of 5 years of project management work that comprises of the 7500 hours of experience in directing and leading projects along with 35 hours of project management course or education. Other than this, you can also take PMP certification if you have a secondary degree (associate degree, high school diploma or the equivalent) along with 3 years of experience in project management which comprises 4500 hours of directing and leading projects with 35 hours of project management education. For PMI members, computer-based exams will cost around $405 while $555 is for non-members. Paper-based exams will cost you around $250 if you are a PMI member otherwise you will have to pay $400 for it. You might think that it costs high but it will be worth it as it is one of the highest paying project management certifications. So, you can be sure of getting a better job opportunity after getting PMP certification in your hands. If you don’t believe how much it is useful in project management, you can talk to the professional experts available at any project management training institute. They will help you to get rid of all doubts and queries related to the project management certification course. The term ACP stands for Agile Certified Practitioner and this certification is provided by the Project Management Institute. That’s why it is known as PMI-ACP certification and it provides you with high-level professional sincerity. In this course, you will explore various tools and fundamentals of Agile and you will get to know the methods to work on Agile projects in the most appropriate manner. You can’t go for a course which can’t allow you to get global recognition and for that this course will be perfect for you. It is a globally recognized course and can help you to direct all demands of associations which basically are dependent on the Agile practitioners who are certified. PMI-ACP is also considered at the top in the list of best agile certifications. The main advantage of getting this certification is that you will get the chance to learn a lot. Of course! You learn a lot in all of the top project management certification courses but in PMI-ACP, you will learn about different Agile tools and fundamentals which are required in any business or company. You will be able to use your expertise in order to complete any project in a successful manner. The PMI-ACP certification is offered by the Project Management Institute (PMI). When you will get this certification on your CV, you will be able to get better job opportunities in the project management field. If you are really serious about your career in project management, then you should definitely opt for this course. For PMI members, computer-based exams will cost around $435 while $495 is for non-members. Paper-based exams will cost you around $385 if you are a PMI member otherwise you will have to pay $445 for it. It is basically a precursor to PMP certificate and also administered by Project Management Institute. The Certified Associate in Project Management Certification is for professionals who don’t have a college degree or just have got experience in project management. Candidates who want to get their PMP certification by following steps, and then they can select CAPM as their course. It is a kind of entry-level project management course for the project managers. One can also call this as a first step to get PMP certification and it’s totally worth to invest in CAPM certification. The CAPM certification is offered by the Project Management Institute (PMI). Preparing for Certified Associate in Project Management (CAPM)® Certification exam? Check your current preparation level with CAPM® free test Now! 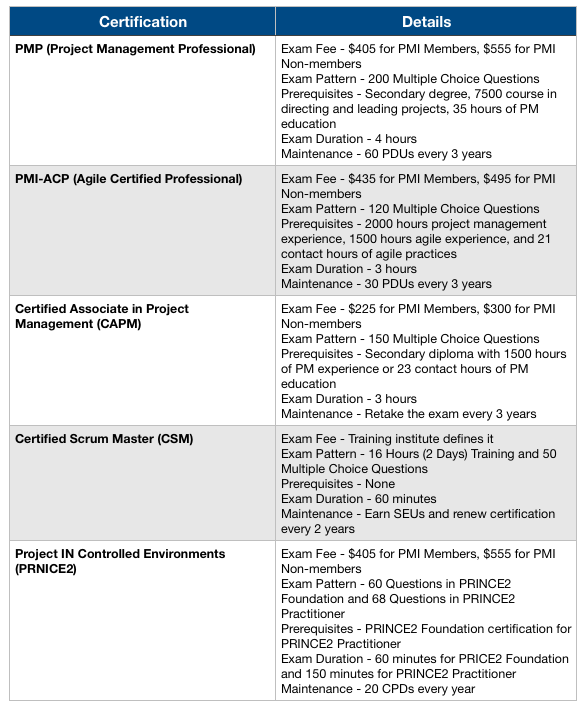 To get this certification, the PMI members will need to pay the amount of $225 while non-members will need to pay $300 to get this certification from any Project Management Institute. You can think that amount can be refunded soon as you will see development in your career on a regular basis. So, this was the important information about the CAPM certification course and you can know more about the course details after visiting the institute. The professional executives of the institute would help you to know about the course details and fee structure in a proper manner. So, you can select the institute which can allow you to complete the course without spending an excessive amount of money. Even if you won’t pay much money for the course, still it will remain one of the highest paying project management certifications in the world. It is not surprising that the IT sectors require qualified professionals and that’s why you need to be prepared for it. If you will select the best certification and get it in your hands, then you will be able to hold the positions of project manager in the best manner. CSM is ranked as one of the best project management certifications for scrum professionals all over the world. There are a number of Scrum master certifications which are available in the market but CSM is one of the best options which you can choose. CSM stands for Certified Scrum Master and it is a great way for the project managers to start working as a Scrum practitioner. The main organization behind this certification is Scrum Alliance and it is a non-profit organization which encourages Agile and Scrum practices in order to ensure qualified professionals in the field of project management. It also helps to promote different types of learning events, user groups and also provides resources and helps candidates in professional development. Being one of the highest paying project management certifications at the entry level, CSM certification can be beneficial for the employees to get promotion in an easier manner. You are never going to regret taking this course because this certification if very beneficial for you in every manner. CSM certification is offered by Scrum Alliance. 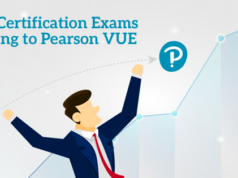 After this, you can apply for the certification exam and when you will clear the test, you will get the certificate in your hands in no time. Both online and offline tests are held for this certification. So, it is your choice which exam method you select for yourself. To get this certification, you will have to spend around $995 to $1395 dollars but it totally depends on the training provider. So, you can select the training provider that could help you to get the Scrum Master training course at reasonable prices. If you are looking for one of the best project management course, then the PRINCE2 Certification course can be a nice option for you. Project IN Controlled Environments Certification was started in England at first and then it became famous in Europe. This certification is mostly practiced by governmental organizations in Europe. This is the most practiced PM certification in the world among the various certifications available. There are basically two types of primary certifications and these are PRINCE2 Foundation & PRINCE2 Practitioner. What is the difference between these two certifications? The Foundation certification is a kind of entry-level certification in which simple project management terminology & techniques are approved. So, if you want to get towards the PRICNCE2 Practitioner certification, then you have to clear the entry level at first. So, Practitioner certification is for the project managers who have got through the PRINCE2 Foundation successfully. If you are interested in sharpening your skills related to leading, execution, and presentation of projects in different aspects, then you can go for the PRINCE2 Certification course. It ranks among the top project management courses and you will learn a lot about the introduction, pre-project, delivery and methods of closing delivery in an easy manner by getting admission in the best institute to complete this certification course. The PRINCE2 certification is administered in the UK by the APMG. The PRINCE2 certification is offered by ILX Group. First of all, you need to complete the PRINCE2 Foundation course. It will require you to complete the PRINCE2 Foundation certified training course of 3-days duration and then you will have to pass the PRINCE2 Foundation certification examination. If you are interested to apply for the Foundation course, then you will need to pay an amount of US$ 200, and for the Practitioner course, you will need US$ 340 dollars. You might think that you have to pay a huge amount of money to get a certificate while some of you must be thinking it is worth it or not. So, if you will add PRINCE2 Certification to your Resume, you are definitely going to get better opportunities in the field of Project management. You are able to get the chance to learn more and more about it and this is the reason you should not think for another second before choosing a certification course for yourself. So, these are the top five project management certifications which are necessary for every person who wants to excel in the field of project management. These days, it is not easy for everyone to carry the sophisticated project work and that’s why skilled and certified professionals are required for this work. So, you can select from one of the above project management certifications and add it your resume. It will definitely do magic in enhancing your salary or position in the project management division of your company. Preparing for a project management interview? Here are the top project management interview questions that will prepare you to ace the interview. Now you have known about the top project management certifications and the importance of these certifications keep increasing year by year. For most of the relevant roles, project management certifications are required. You can make an informative decision on the most appropriate certification for your career among the top five options given above. You won’t regret the decision of getting certification if you have selected the appropriate course. So, if you are aspired to get a project management certification, start your preparation now. Whizlabs project management certification training courses help you to prepare and pass the certification exam in the first attempt. So, join us now and get yourself ready to become certified in project management. Have any doubts or queries regarding these certifications? Write to us at Whizlabs Forum to connect to our experts, clear your doubts, and resolve your queries.